Rétromobile 2018 : quelles tendances pour les Ferrari ? 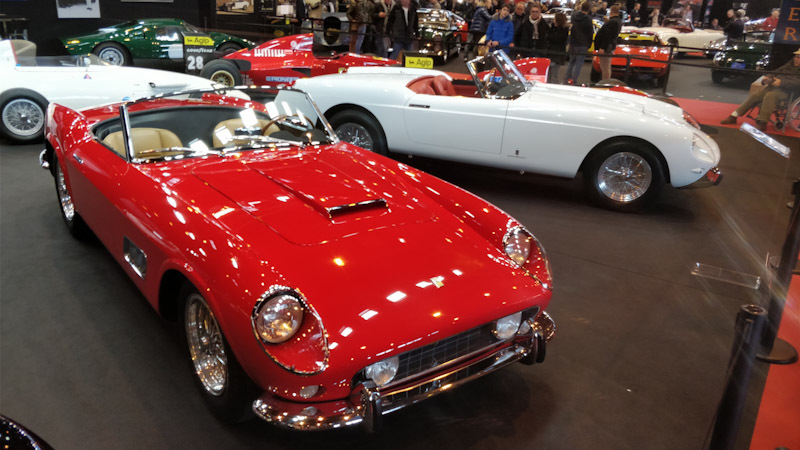 Retromobile 2018: what trends for Ferrari? Each year, Rétromobile, in the heart of winter, launches the season and lets you see the market trends. Which Ferrari will be in the spotlight this year? Which Ferrari will be on sale? What is the market trend? What new Ferrari books are coming out? Which coachbuilders and vendors stand out and have the wind in their sails? What have the different event organizers prepared for 2018? Retromobile allows you to make a first round of these questions. With the 50th anniversary of the iconic Ferrari Daytona being celebrated this year, you could see a lot in this 2018 edition of Rétromobile. You could see the stand of Ferrari Classiche, which seems the least of things, but also on stands of insurers, who know how to put forward. 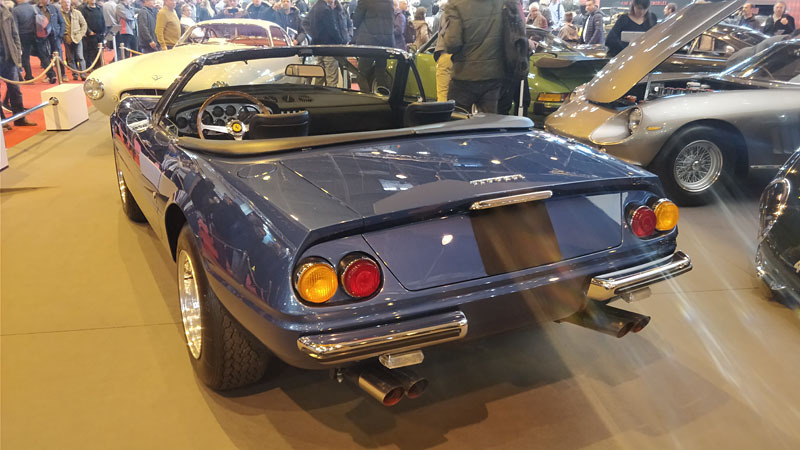 In all I counted a dozen Ferrari Daytona present at Rétromobile, which makes it the most present Ferrari! This is exceptional ! Exceptional also, the fact that among this dozen Ferrari Daytona, you could admire two beautiful copies of Ferrari Daytona Spider! 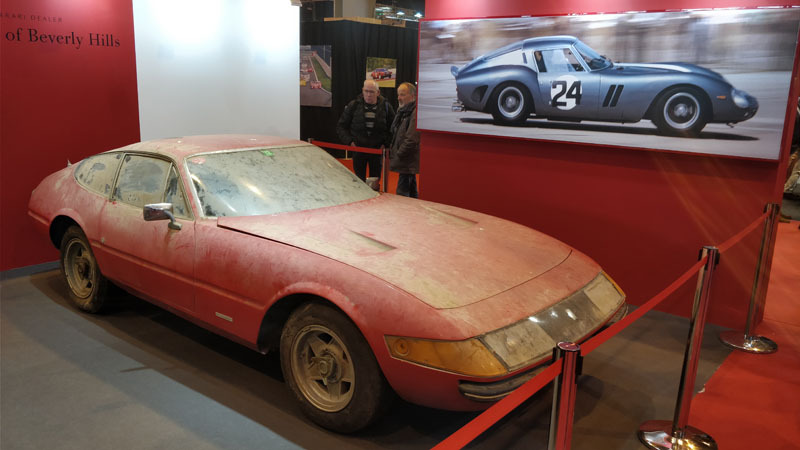 On the Ferrari Classiche stand, the dust-covered Ferrari Daytona, with cat's footprints, was Japan's famous "barn exit". 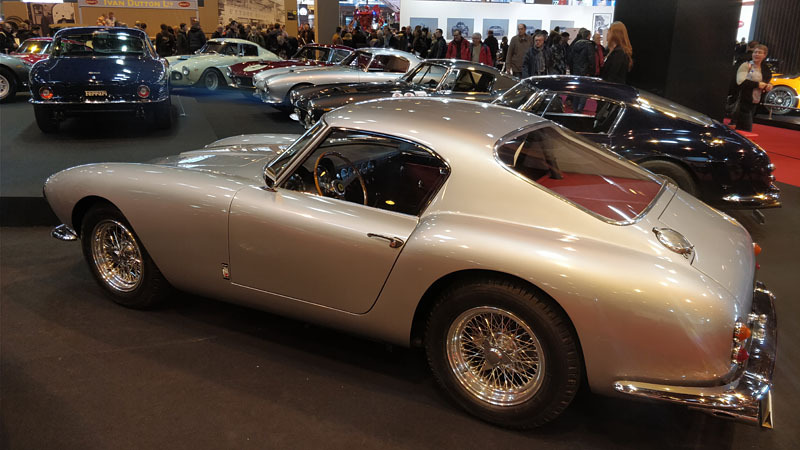 Equally exceptional, there were almost as many Ferrari 250 GT Passo Corto (or SWB for Short Wheel Base in English) present and mostly almost all on one stand, that of Lukas Hüni. This model is probably my favorite in the classic Ferrari, so seeing as many gathered, I was thrilled! A unique copy was present in the lot: the Ferrari 250 GT SWB bodied by Bertone and which is rarely visible. Unfortunately for the photos, he was exposed in the middle of the stand, with many spots shining on his dark blue body. Among the other classic Ferrari, you first noticed three Ferrari 250 GT Cabriolet: a series 1, a series 2 and a California. All three in beautiful condition. You then noticed all the Ferrari 275 GTBs present. I counted no less than six. There was also a blue Ferrari 250 GTE, a red Ferrari 275 GTS presented by Gallery Aaldering or a grey Ferrari 330. You could also meet, at the turn of a stand, a Ferrari 166 MM, one of the first Ferrari produced by Ferrari. Some Dino were present at Retromobile, but much less than in previous years, from my point of view, as if the fad was a little past. 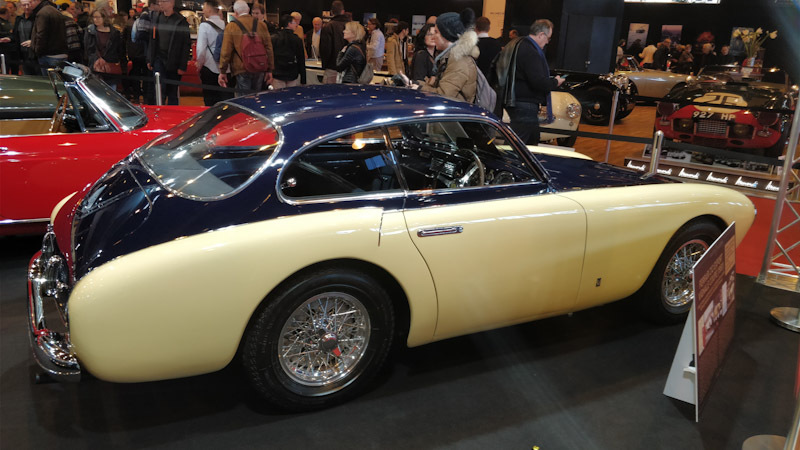 Among the rarities, a Ferrari 212 export Vignale from 1951 was exhibited on the stand of Gallery Aaldering. A very nice Ferrari 250 GT Lusso was next to the Sport & Collection stand. 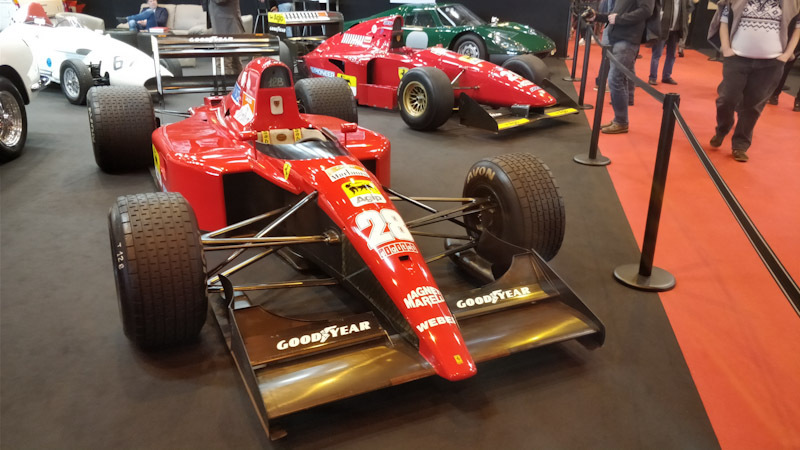 Several F1s of the 90s, driven by Alain Prost, Jean Alesi and Gerahrd Berger were present in the alleys of Rétromobile 2018. You could also admire a Ferrari 512 M, driven by David Piper, as well as a Ferrari 512 BB LM of the Ecurie Francorchamps, driven by Beurlys. This year there was from my point of view much less recent Ferrari on the stands of different sellers. 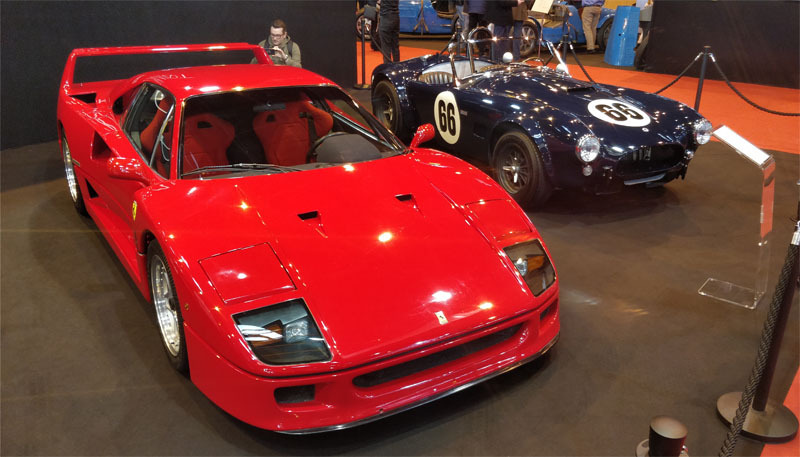 The list is not exhaustive, but if I look at my photos, I count: two Ferrari F40s, including one on the Movendi stand, a Ferrari Enzo auction, two Ferrari F355, some Ferrari 308 and 328, and two Ferrari BB 512 including a beautiful, restored, brown / gold. 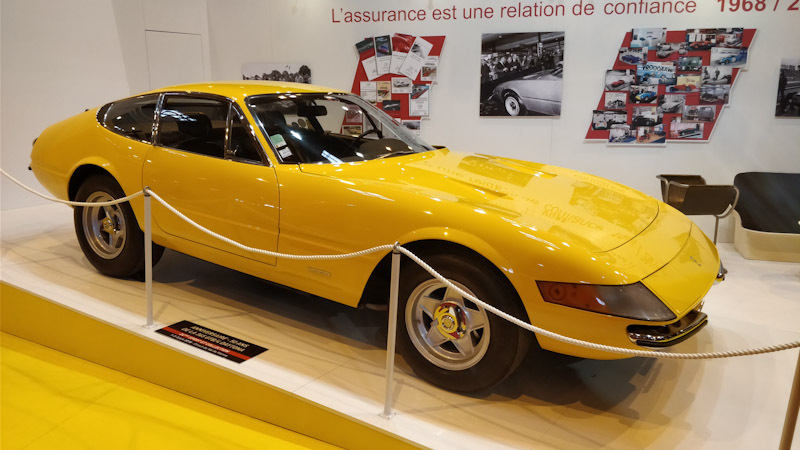 Following the recent death of Johnny Halliday, one of the trends of this 2018 edition of Rétromobile was the cars that belonged to him. 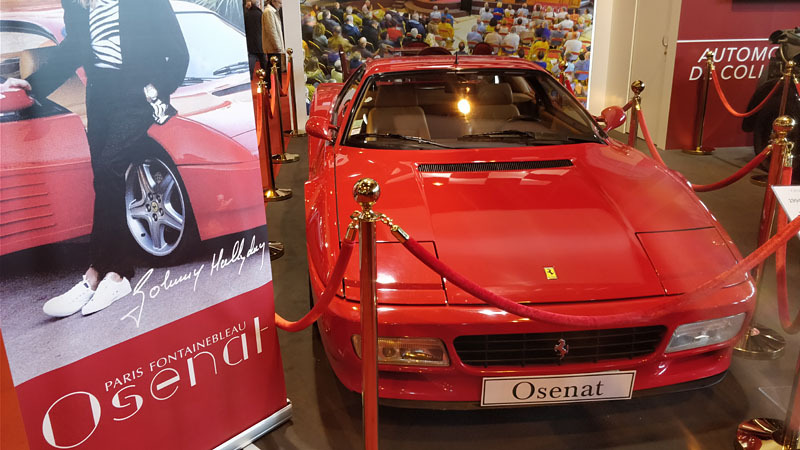 A Ferrari 512 TR, which will be auctioned in March, was exhibited on the Osenat stand. There are many other very interesting automobiles in Retromobiles apart from Ferrari. For example, you can see your grandmother's Renault 4cv, or your father's Renautl 9, in the youngtimers section. You also have Renault taxis of the early twentieth century that offered you a ride outside the exhibition halls. 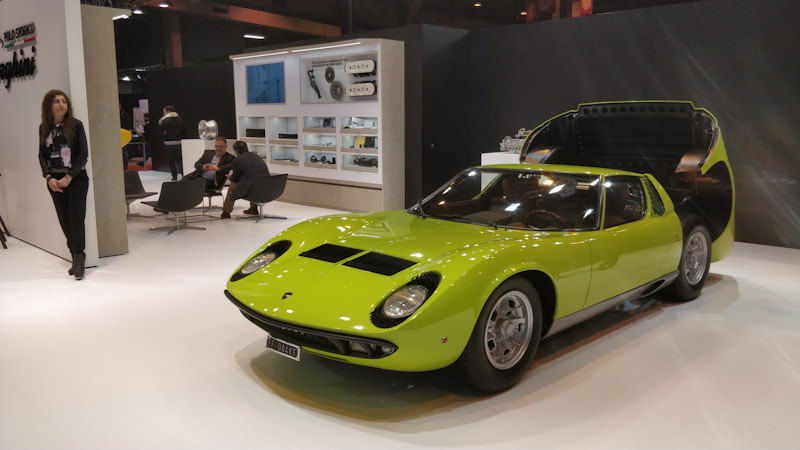 My favorite, because it was really beautiful, was the Lamborghini Miura Verde presented on the stand of the Polo Storico Lamborghini. This is another trend, with the presence of the manufacturers' restoration centers at Rétromobile. 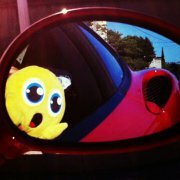 They all play, including Ferrari, on their archives that they stage to assert their strong point. Rétromobile is also a lot of meetings. I had the chance to visit backcountry this year with @Mike051 and Olivier. We met other members of Ferrarista on site, according to the aisles, whose @LUDO and @Caesar Nello. This event allows you to take the time to chat with other enthusiasts around the models. After a 2017 edition of Rétromobile devoted among other things to the 70th anniversary of Ferrari, this 2018 edition could have seemed very bland to the owners of Ferrari. It is not, as you have read, with, among others, the 50 years of the Ferrari Daytona and the dozen Ferrari 250 GT SWB present. 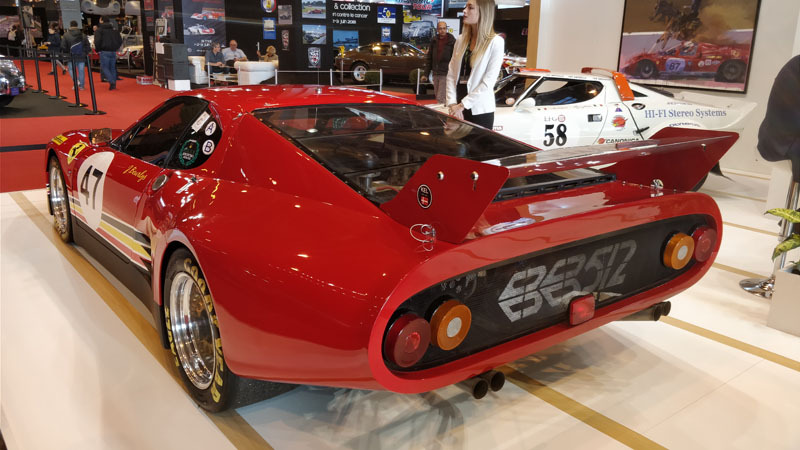 Have you been to Retromobile 2018? What are the Ferrari and other models that have the most marked you? What did you notice about the auctions? Do you have questions if you could not get there? C'est a chaud le reportage comme on dit, merci Franck. 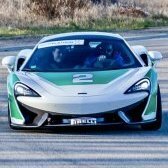 Ça résume très bien la présence Ferrari de cet année, c'est mon impression également : beaucoup de belles Ferrari. 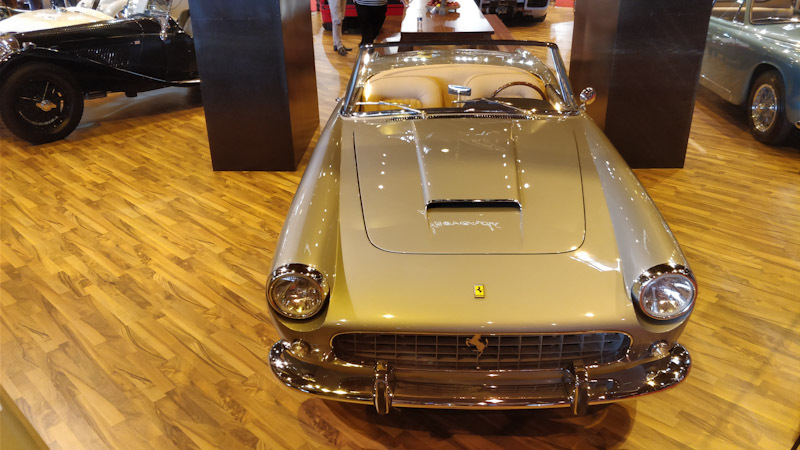 Une très Ferrari 250 GT Lusso se trouvait à côté du stand de Sport & Collection. Sinon quel autres marques, modèles méritent d’être évoqués comme souvenir? Pour moi Jaguar Type-E, il y en avait plein et très joliment restaurées. Le stand Jaguar également très bien présenté. Sinon un autre modèle m'a impressionné, je ne saurais pas dire si cet année il y a eu plus de présence, c'est le Facel Vega. Une Facel 3 cabriolet 2 places superbe, qui était d'ailleurs affichée vendue! Merci @dfiordean pour ce commentaire détaillé. Effectivement je confirme, beaucoup de belles Jaguar Type-e et quelques Facel Vage aussi, remarquées par ceux qui m'accompagnaient. Ce soir je termine de relire l'article écrit "à chaud" (merci pour le manque remonté) et d'ajouter des photos. Demain je posterai le reste de mes photos, car j'en ai beaucoup, dans le sujet consacré sur le forum. Tres belle visite et de tres belles rencontres effectivement! Franck, tu sais que sur l’aspect F1 je suis « legerement » pointilleux: sur les F1 Ferrari, c’etait des annees 90: precisement 1991 pour les 642 (issue de la fabuleuse 641 de 1990, lignée John Barnard) et 643 (le fameux « camion » du professeur), ainsi que la 412t1B de la seconde partie de la triste saison 1994. 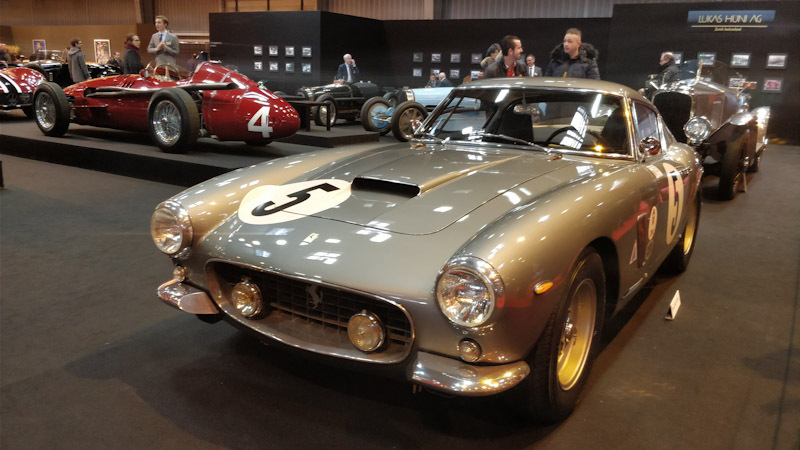 Merci @Mike051 pour cette journée à Rétromobile 2018 et ce commentaire, avec les années précises et le détail des F1 Ferrari présentes. J'ai corrigé du coup dans l'article aussi. Merci pour ce reportage, Franck. J'espère que nous aurons d'autres photos, notamment dans le sujet consacré. Je suis cependant un peu frustré : tu poses pas mal de questions dans l'intro de ton sujet (quels évènements, quels livres, etc ...) mais je ne trouves aucune réponses ! Sur la photo avec le line up de 250 SWB, as tu noté que la grise au 1er plan présentait une caractéristique rare ...j'ai d'ailleurs posté une photo de cette voiture il y a quelques jours dans le sujet "vos meilleures photos et vidéos de 250 SWB". Pour les spiders Daytona, je suis toujours un peu sceptique, tant le nombre de conversions est important. As tu la certitude pour la gris-bleu ?